From the "jack wax" to the "golden delicious", nothing compares to making and then enthusiastically consuming your own maple syrup. But at the end of sugaring season, every sugar maker is faced with the daunting task of cleaning up their equipment. It's not a difficult task, but it can be terribly time consuming. For this example, let's assume you are a backyard sugar maker with a 30 tap operation who boils their sap in a small "hobby" sized evaporator. Pull your plastic taps or metal tapping spiles from the sugar maple trees. Collect your sap buckets, collection containers, plastic tubing, connectors and lids. Place the taps, spiles, buckets, collection containers, lids, tubing and connectors in the laundry tray. Put on the rubber gloves. Fill the laundry tray with the hot water, add a very small amount of bleach, and using the scrub brush, scrub everything clean of sap, dirt or dead ants. Use the tap cleaning brush to remove any bits of sawdust or debris from the plastic taps or metal spiles and tubing connectors. Drain the sink, refill with fresh warm tap water and rinse everything thoroughly. This will remove any trace of the laundry bleach which was used to disinfect your sugaring gear and kill any mold which may have formed inside on their damp surfaces. Dry everything thoroughly with the towels. The plastic taps, tubing and connectors may need to be set aside until they can dry both inside and out. Once thoroughly dried, put everything away in a clean sealable storage container. Remove the evaporator pan and place it on the saw horses. Add some hot water and using the scrub brush and nonabrasive cleanser remove any carmelizing and nitre (condensed mineral salts) from the inside. Rinse out the evaporator and repeat the regimen until it is completely clean. 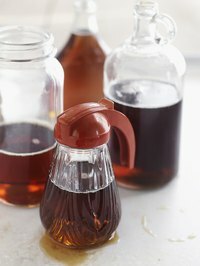 Remove the draw-off valves and place them in the plastic bucket of hot water to soak away any syrup coating their interiors. Once they are clean and free of any sticky residue, dry them and store them away. Flip the evaporator pan over, exposing the sooty underside. Hook up the pressure washer or pressure nozzle and blast away any loose soot. Use the scrub brush, scouring pads or copper wool and nonabrasive cleanser to remove any stubborn soot stains. Once completely clean, place the evaporator in a warm and sunny outdoor location and allow the air and sunlight to dry it completely. Then cover it and store it away. Don your work gloves, and using the small shovel or trowel, remove all of the spent coals from the firebox. Place them in the metal bucket and dispose of them. Add enough fresh builders sand to replace any that was lost from the firebox during the removal of the coals. Locate your tapping auger, and, using one of the rags,; apply a light coating of vegetable oil to the entire surface. Wrap it in a clean rag and store it away for next year.